Unlike many jockeys, Stacy wasn’t born into the horse racing business. She was a teacher for 14 years, but loved racing so much that she spent the final three years of her teaching career exercising and training horses during the summer months. In 1999, she took out her jockey’s license and began to ride at fair meets, small tracks and, ultimately, at Turf Paradise in Arizona and at Mountaineer in West Virginia. Then tragedy struck. In a race in August 2000, Stacy’s horse hit a rider-less horse running the wrong way. The race was run in poor visibility and there was no time to react: Stacy’s horse and the runaway collided at full speed, catapulting her high into the air and changing her life forever. Stacy suffered such severe brain injuries that doctors gave her little chance to survive. They removed a portion of her skull to allow swelling to subside, and the jockey lay motionless in a coma for three weeks. 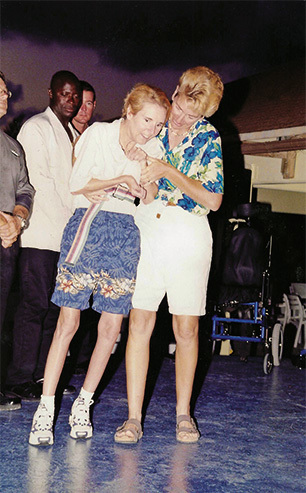 But she did survive, thanks to intensive medical attention and the care of her longtime partner, Jan Hortyk. Stacy now speaks and walks with great difficulty and doesn’t remember much about her riding career. She has a pump implanted in her abdomen to deliver medication for constant pain and she has endured countless surgeries. The financial drain has impacted her life both physically and emotionally. She requires constant care. Money from a financial settlement with the racetrack and insurance is long gone. Tad Leggett always wanted to be a jockey. Although he rode some Thoroughbreds, Tad is best known as an accomplished Quarter Horse jockey with a career spanning two decades. He piloted Quarter Horses in Oklahoma, New Mexico, Iowa, Texas, and other states, winning 131 QH stakes races including eight Grade 1 races. But in June 2010, his life and that of his family changed forever. Thrown to the ground after pulling up his mount, Tad sustained a broken neck and other serious injuries. He was placed on a ventilator and underwent a nine-hour surgery to insert screws and plates into his neck and spine. He developed pneumonia and doctors worried whether Tad would survive the ordeal. Tina Leggett was determined her husband would not spend the rest of his days in a nursing home attached to a ventilator. Tad was transferred to Craig Hospital in Denver, a well-regarded center for the rehabilitation of spinal cord and traumatic brain injuries. He spent three months there, undergoing grueling physical therapy and was gradually able to breathe on his own. He regained some feeling in his fingers and could move his hands and arms. After a while, Tad was able to pull himself up out of his wheelchair to stand, but doing so was exhausting. Tad and Tina returned to their home in Bandera, Texas, but many challenges lay ahead. He is often in poor health as a result of his paralysis and battles both physical and emotional issues. Gary Birzer practically grew up at the racetrack. His father was a jockey (and, later, a trainer) and his brother, Alex, is still in the saddle. But Gary didn’t start race riding until 1997, at age 21. He rode mainly on the Midwest circuit as well as at Suffolk Downs and Mountaineer Park, enjoying a successful career that included several stakes wins. At age 27, his riding days suddenly ended in a horrific accident. Gary was thrown to the ground and another horse and rider fell over him. He only remembers bits and pieces of the spill that severed his spine in two places and left him paralyzed from the waist down. Gary spent many months in rehabilitation, amassing over a million dollars in medical bills. As if the accident wasn’t nightmare enough, Gary learned that his insurance coverage for catastrophic injury – a policy he had faithfully paid into – had lapsed years earlier. 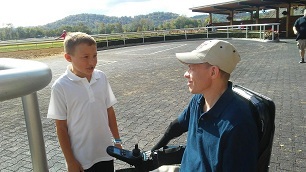 Lawsuits ensued; the jockey now had to deal with both lawyers and doctors while coping with his life-altering injuries. Five years after his accident Birzer’s legal woes ended, but the settlement hardly covered his mountain of medical bills. The PDJF stepped in to help. 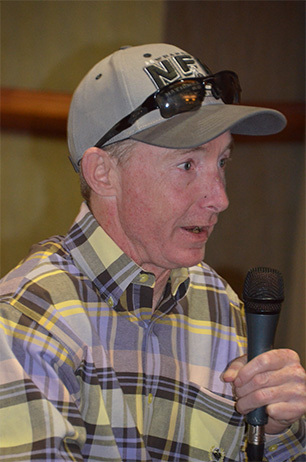 “The PDJF is invaluable to me,” says Gary. “Without it, I wouldn’t be able to live the way I do.” He uses his monthly stipend to pay for medical supplies, nursing care, and living expenses. Gary attends PDJF events and drives a specially-equipped van. “I just want to get stronger and healthier day by day,” he says. Our objective is to work with others in the racing industry to secure guaranteed funding for our disabled riders.